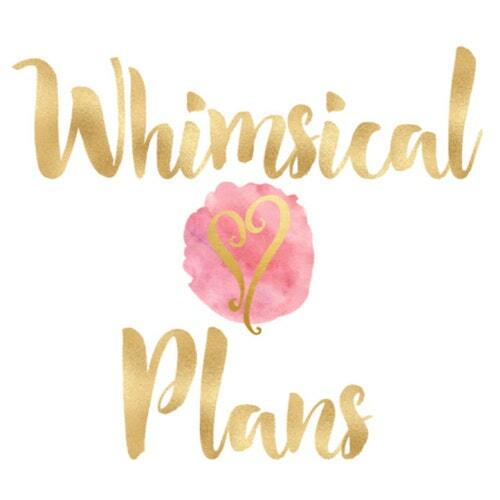 Even though this isn't an Indie Weekends post, it is still an indie shop and when Wick Habit contacted me to see if I'd be interested in reviewing some of her products, I jumped at the chance! 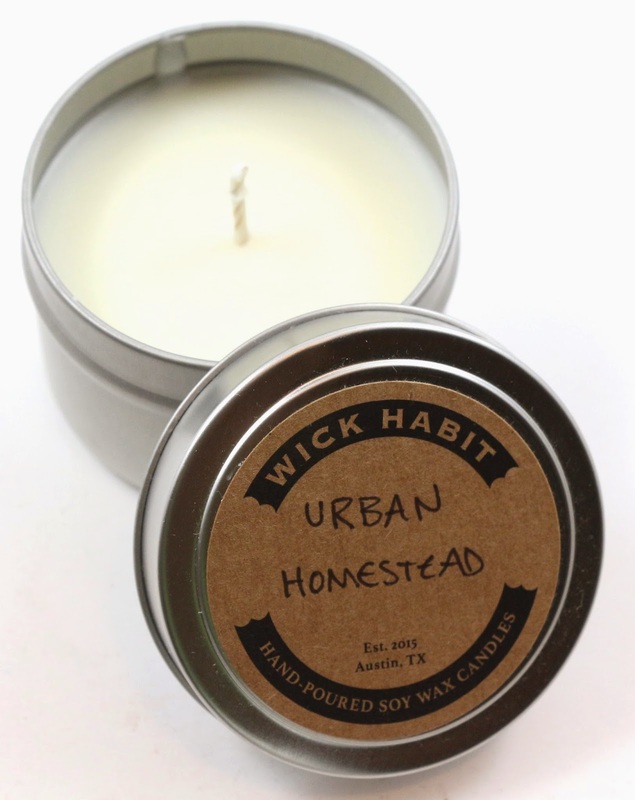 Wick Habit carries soy candles that are inspired by the smells of Austin, Texas, which is where the owner, Erica, is from. 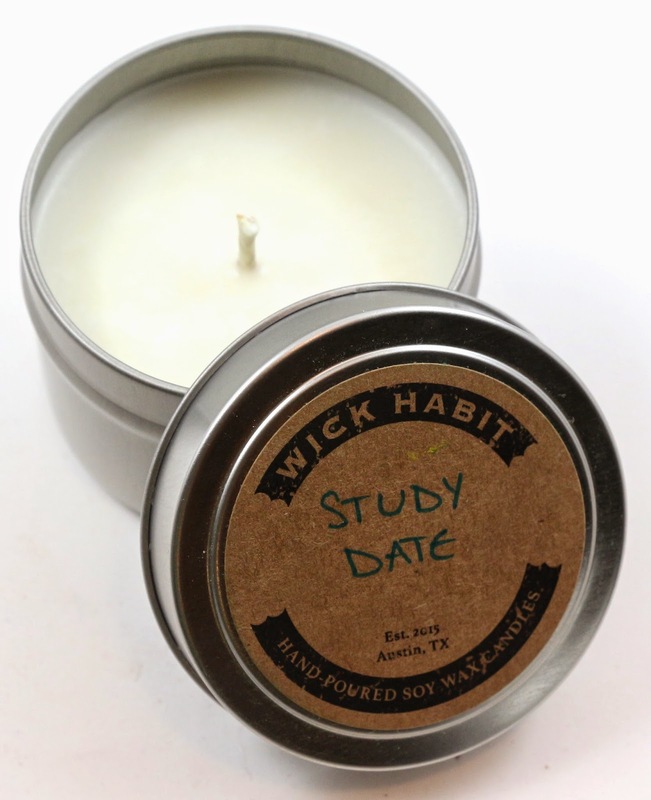 About - Wick Habit specializes in handmade soy candles inspired by the smells of Austin, Texas. 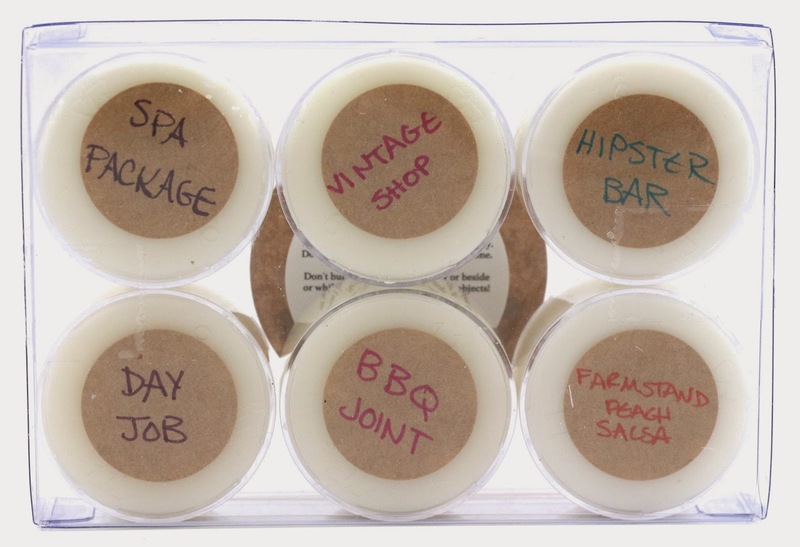 Erica is the owner and offers tea light samplers, 4 oz and 8 oz soy candles, with interesting scents like BBQ Joint, Winery Tour, and Birthday Donkey. I picked 6 scents, and then I told Erica to pick some of her favorites for the others. Shipping - I'm so used to never getting tracking for things I'm supposed to review, that it was a nice surprise to get a tracking number for this. It immediately shipped and arrived in 2 days via USPS 2-day Priority from Texas to California. Product Size - Candles are offered in tea lights, 4 oz tins, and 8 oz tins. Free Samples - I received one free tea light with my order. Study Date - "Old books, wood, peppermint tea"
I don't really smell the books or wood, but it definitely smells like peppermint tea. It also has a bit of a peppermint candy vibe. I'm not a huge fan of peppermint, but I think this will be a good one for the fall and winter. Urban Homestead - "Rich soil, tomato leaf, herbs"
I really like this one, it just smells like tomato leaves, which I absolutely love the smell of. I burned this one for a few hours and it burned very nicely, not very strong, but did give the room a light scent. Which I actually prefer because really strongly scented candles tend to give me a headache after a few hours. The sampler comes in this really nice plastic packaging, which makes it handy to travel with these, or just transport them around the house like I do. 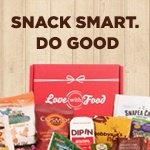 Was it really any surprise I picked mostly food and drink scents for the sampler? Not really, I couldn't wait to see what BBQ Joint smelled like. Ribs I hoped. Spa Package - "Lemongrass, eucalyptus, spearmint, lavender"
I am glad I got this one, I probably wouldn't have normally picked it on my own, but it smells quite lovely and relaxing. Vintage Shop - "Old clothes, tea, dried flowers"
This one mostly smells like tea and flowers. It's not my favorite, but it's more interesting than I expected. Hipster Bar - "Cut wood and bourbon"
This has a light scent of bourbon, it's nice. I bet this would be good burned at the same time as BBQ Joint. Day Job - "Coffee and pastry"
This smells like strong coffee and a bit of something sweet. BBQ Joint - "Coffee-rubbed brisket"
This smells like smoky bbq sauce! I have no idea when I'll burn this one, but I mean, it's as good a time as any to make the house smell like bbq! Farmstand Peach Salsa - "Ripe peaches, peppers, lime, cilantro"
I burned this one for a little while, and the tea lights can be burned right inside the little plastic container. And I'll also mention these candles burn really cleanly. There's barely any smoke when you blow them out, and when you start them they don't pop like some of my other candles do. And here's my free sample, it comes with a little business card as well. Yep, it smells exactly like a lemon lime soda! 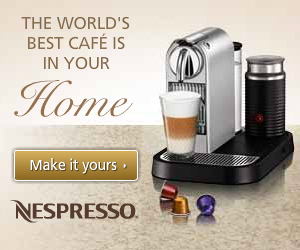 It even has a bit of a bubbly scent to it. 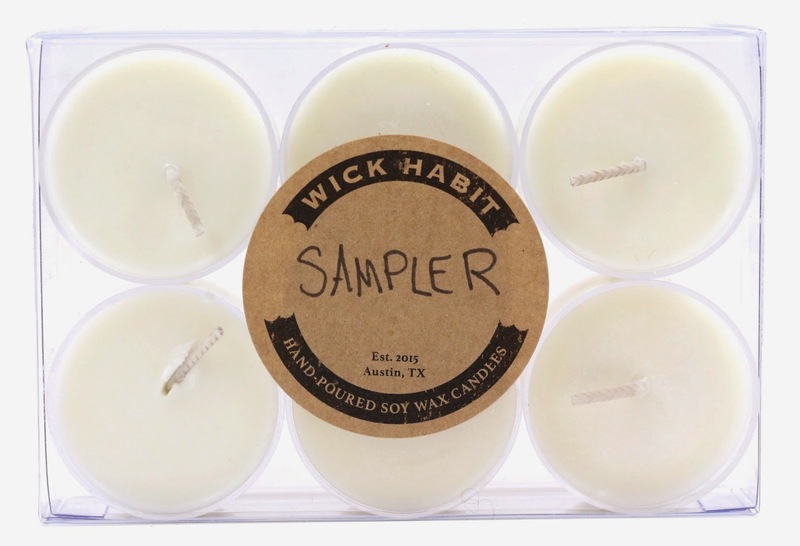 Overall, I really enjoyed the unique candle scents from Wick Habit, and I'd be interested in trying others. Like I mentioned, I prefer that they aren't really strong as that can give me a headache, so these have the perfect amount of fragrance in them for me. And I think this is my first time using soy candles, and I really like how they burn. I did notice that all of the tea lights weren't quite filled to the same level, one was completely full, another was missing about a quarter inch. My favorites were Farmstand Peach Salsa and Urban Homestead, but I have to also give an honorable mention to BBQ Joint, because that's just awesome. 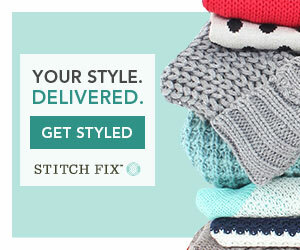 Customer Service - I can't attest to the customer service, but when Erica contacted me, she was very sweet and quick to ship and respond back. Availability - All of these scents and products are available on the Wick Habit site. Overall Satisfaction - I enjoyed these candles, and I would consider purchasing other scents. These would also make great gifts for certain people in your life who enjoy unique candle scents. 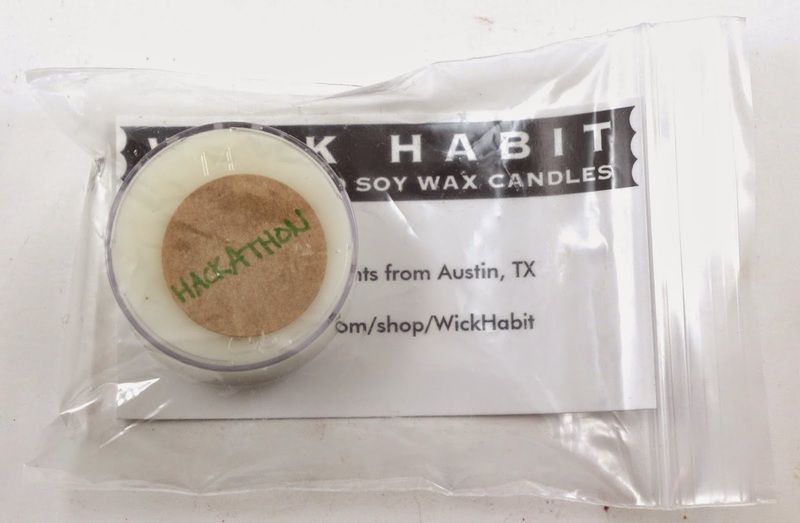 What did you think of Wick Habit? Let me know in the comments! Disclosure: I received these products complementary for review purposes. This is my honest review.